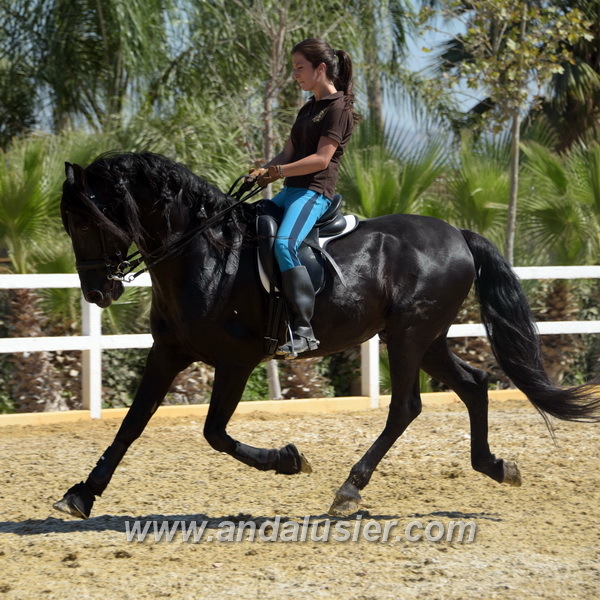 Fatuo de Nadales, a qualified (calificado) black PRE stallion, which is currently used as a stud by his own breeder Nadales. His origin is mainly based on famous Yeguada Militar lines, just like his grandfather Leviton (father of well-known Olympic stallion Evento). He is not only trained in High School Dressage but also qualified in Grand Prix. As a multiple finalist of SICAB, an international horse fair – dedicated exclusively to the Purebred Spanish Horse, he already featured the beauty and capability of the Spanish Horse. In 2013 Fatuo succeeded in becoming Spanish champion of young riders, ridden by Gema Nadales, the daughter of his breeder. In several Andalusian Championships he demonstrated his ability and won lots of medals. In August 2016 he emerged victorious at the CDN*** Copa Ancce in Jerez de la Frontera. Fatuo impresses with a good attitude, a remarkable character and a great heart. He is absoluty eager to work and completely easy to handle. This stud already has produced a great number of registered PRE beauties.